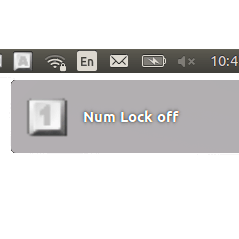 For desktops and laptops that have a separate numeric keypad, it might be useful for NumLock to be turned on automatically when your Ubuntu boots up. This quick tutorial will show you how to do it in Ubuntu 14.04. First click the below button to bring up Ubuntu Software Center and install numlockx. Then press Alt+F2 and paste below command into the dash. Hit enter and type your password when prompt. It will open the lightdm config file with gedit text editor. Finally restart your computer. The numeric keypad should turn on automatically when you’re at the login screen, and stay on after logging in. Its a stupid problem on Ubuntu!…. but a good solution. I added numlockx as a startup program before restarting too. to my lightdm config causes startup problems – forced into low-graphics mode. Pressing enter after pasting the gksudo command into the dash resulted in… absolutely nothing. Once again I find myself trying to- make that, wanting to like Linux but what I feel should be a simple task turns out to take so many resources. Am I honestly supposed to believe that the more difficult tasks are going to be easier when activating numlock at startup is this bad? Just want to note that the image (http://ubuntuhandbook.org/wp-content/uploads/2014/06/numlock-off.png) in this article, shows an numlock icon in the systray that is not present on my Ubuntu 14.04.1 fresh install. Additionally there is no way to configure the numlock button in 14.04 in the graphical user interface. In my humble opinion this is an EPIC failure on Canonical’s part. What about Ubuntu Trusty Server (14.04.2)? There is no GUI, so this solution will not work. Is there a strictly CLI way to get numlock to turn on (and STAY on) at boot? Currently, I went into the VM bios and set numlock to on, but Ubuntu turns it off when it loads. @Dave: I pasted the command in the shell, and had to install gksu first. This recommendation is from the Ubuntu Community website. When I tried it, it would no longer boot. I’d get an error and have no keyboard or mouse input available. I had to boot to CD and go remove this line from the config file to get it to boot successfully again. I started playing with Linux 14 years ago and have still never got any install to remain stable. It won’t work. The Save button is inactive, Save As won’t work either. There’s another issue: when you try to type numbers using the top keyboard row after you switch the language, the first typed symbol is the “upper” case. I.e. I change from RUS to ENG or vice versa and then type 1. Instead of 1 I get !